With the Discovery Putty: Transportation Station educational toy, kids will have a fun, engaging time while they strengthen their hands, improve fine motor planning and enhance learning skills. They'll mold, stretch and pull at the soft resistance putty until they find various ways to travel. The Transportation Station uses professional, high-quality orange putty that's free of gluten, latex, soy and casein for healthy fun. Pieces include a race car, police car, fire truck, sailboat, bicycle, ship, ambulance, motorcycle, dump truck, airplane and skateboard. Note that the quantity and type of hidden pieces may vary between sets. Parents, teachers and therapists can find many imaginative uses for Discovery Putty for unique learning activities. This might include matching objects to pictures of those objects or developing the different pieces into a board game. They can encourage speech by asking the child to speak the name of the animal and use it in a sentence. FUN AND THERAPEUTIC LEARNING TOOL. This soft, silicone-based putty is easily molded and pulled, providing tactile exploration and strengthening fine motor skills while engaged in imaginative play. UNIQUE HIDE-AND-SEEK GAME. 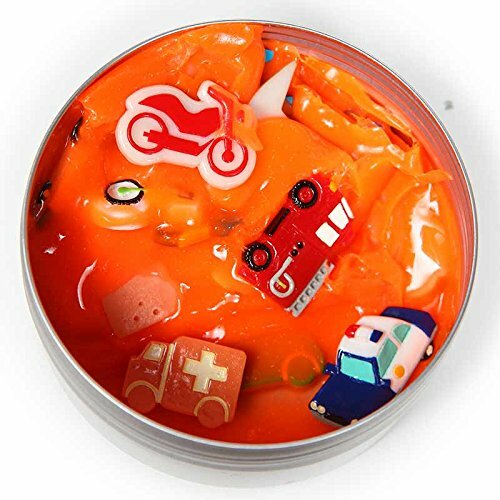 To encourage exploration and play, 12 transportation-themed objects are hidden within the brightly-colored orange putty. After uncovering all the pieces, kids can work them back into the putty for another fun challenge. STRENGTHENS HANDS. Fun and Function's soft-resistance putty helps kids strengthen hand muscles and build fine motor skills as they pull, twist, stretch, roll and mold to search for the hidden objects. VARIOUS LEARNING ACTIVITIES. A top-notch choice for kids with ADHD and sensory processing disorder, Transportation Station Therapy Putty is a calming toy to ease anxiety, aggression and sensory overload, and also helps support speech, color recognition, math skills and language development.